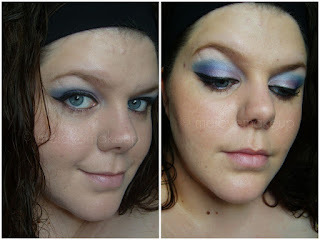 Sophsterlicious • UK Blog: Just a Make Up Look.. This was supposed to be a face of the day post, but the thing is, I'm so lame and I have had this sitting in a folder for a couple of weeks, and now I don't know what I used. I was basically just trying to do something a bit summery on one of our hot days! I used a Pink, Blue and Blue/Purple colour. I love it, your liner is perfect! I love the strong eyeliner, and your application of it is perfect.